Last week's racial equity impact assessment meeting. Photo provided by Juan Sebastian Arias. 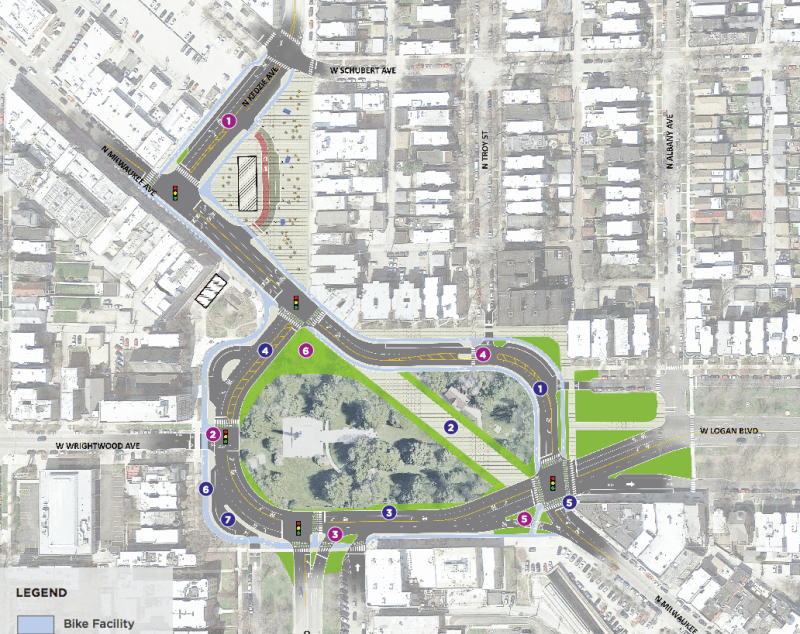 As part of the Chicago Department of Transportation’s ongoing project to improve safety on Milwaukee Avenue, Logan Square’s namesake “square” (really, a traffic circle), which is currently dangerous and inconvenient for pedestrians and cyclists, is slated for a redesign. CDOT has laid out four proposals, and residents have been able to weigh in online and at various public meetings over the past year. The department will select a final design in the coming year, with construction scheduled for in 2020. As any Northwest Sider with a pulse can tell you, Logan Square has seen some major changes in the past decades. From 2000 to 2014, roughly 19,200 Latinx residents left the neighborhood — a 35.6 percent drop, according to a DNAinfo report. Many of them were lower-income and working-class people forced out as property values, taxes, and housing costs rose in conjunction with an influx of white and more affluent newcomers, plus upscale retail and development. 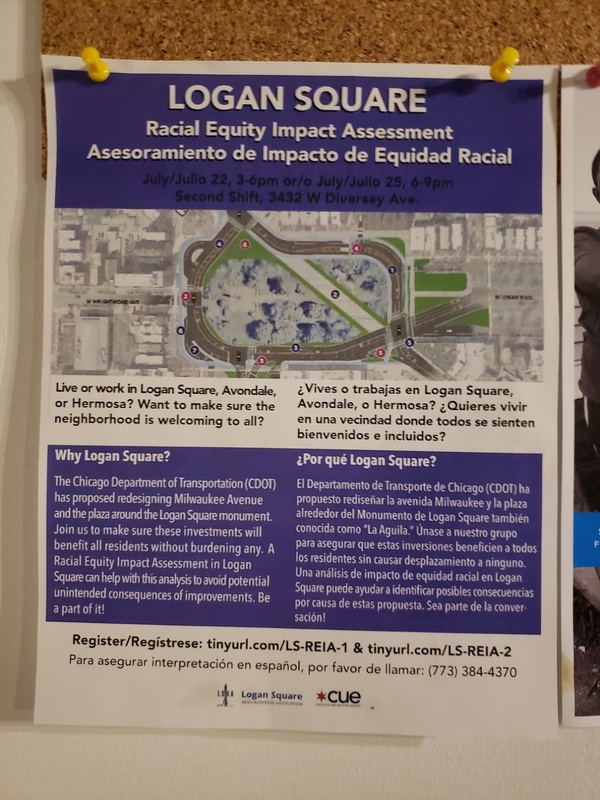 In an effort to stop the displacement of longtime residents, the Logan Square Neighborhood Association — a longstanding nonprofit champions of affordable housing and racial and economic justice — is partnering with the Chicago United for Equity group to conduct a Racial Equity Impact Assessment on the proposed circle redesign project. A REIA is a tool that may be applied to plans or policies to assess whether they will ultimately benefit the many or just the few, especially when it comes to race. LSNA and CUE began the process in January and have conducted two public REIA trainings thus far, the second of which was last Wednesday, July 25, at Second Shift in Logan Square. Photo provided by Juan Sebastian Arias. View more photos of the meeting. LSNA youth representative Ashley Galvan Ramos kicked off the session by telling the story of her own family’s displacement from Logan Square. Christian Diaz, lead housing organizer for LSNA, explained that when longtime residents have to leave the neighborhood, it’s not just a matter of losing their housing. People also lose community support networks built over decades, as well as convenient transportation access to jobs and other resources. These losses can be especially hard for already-marginalized folks such as single parents. “The impacts of destabilized housing can be felt for generations,” Diaz said. The Racial Equity Impact Assessment process is a strategy to get residents and others to prioritize racial justice in the planning process, as well as to get those who would be most impacted by neighborhood changes involved in decision-making from the very beginning. Who benefits from a plan or policy? Who is burdened and how? How can we increase the benefits, and decrease the burdens? Juan Sebastian Arias, a CUE fellow, moved to Logan Square from Ecuador with his family in the 1980s. Arias discussed the possible outcomes of CDOT’s four proposed design alternatives for the traffic circle. Some residents are in favor of the boldest options: building a plaza at Kedzie and Milwaukee by Logan Square Blue Line station and routing Milwaukee Avenue traffic around the square instead of through it. Arias noted that it’s important to consider how these changes might affect mom-and-pop businesses. After the CUE fellows introduced the process, they led participants in smaller breakout groups to complete REIA worksheets together. Each group brainstormed not only potential impacts, but also asked how intended outcomes could help advance racial equity. In the groups I observed, I heard some concerns that making the area more accessible and appealing for walking, biking, and spending time would raise property values and rents, which could drive out lower-income residents and small businesses. However, the argument made that improving access and safety for non-car transportation can also help people save money. Participants were interested in accessing data about similar street designs to see if it backed up their suppositions. But they also stressed the value of using firsthand stories in the planning process to highlight the human toll of displacement. New resident Sean Killarney said at first he had assumed that adding green space to the neighborhood would be beneficial for everyone who lives there. “But this process helped me better consider whether [the new public space] was truly needed, and who it would actually benefit in the long run, especially if rents go up,” he said. Chicago United for Equity and Logan Square Neighborhood Association will host another equity assessment workshop in the fall, and will share their findings with CDOT in time for the department’s next public meeting. In the meantime, people can submit comments about the project to CDOT here. One of the downsides of planning is that you have to show up. I know that sounds terrible, but given the huge advances in telecommunications, it feels that tentative steps could be made to have these be held virtually too. If a goal of planning is to be very inclusive, more tentative steps in this direction should be taken. something tangible; getting more rental units built which would bring down overall rent costs; zoning density increases in return for affordable housing set-asides in the developments themselves; having developers like the megamall project reserve small storefronts for mom and pops and startups; allow accessory dwelling units – granny flats – in TOD areas; etc. Get with it people. I kind of feel like this is learning about birth control when you’re 8 months pregnant. The horse has left the barn on this, and the shape of a traffic circle isn’t going to bring it back. I moved to Chicago in 2004 and decided on Logan Square through a process that might as well have involved a dart thrown at a map. I didn’t know Chicago, but I could get a two-bedroom apartment a block off the boulevard for $800, and that’s what made me unwittingly one of the first-wave gentrifiers at a time when I was often the only white guy at the Taqueria Moran. I stayed in the same apartment for 12 years, during which time my rent doubled. I finally left not so much because of cost, but because the neighborhood had gotten really, really annoying at the same time I’d gotten 12 years older. So I feel like I know the people who were there before, and I liked them and sympathize with them. But that old Logan Square is gone, and it’s not coming back. Better to look at strategies others have suggested in this thread that will inevitable change the fabric and culture of this place that’s already changed, but might do it in a way to make it affordable to a more diverse range of people. nearly a decade old in planning is finally becoming a reality. I really don’t see any possible way anyone can assign any specific impact to this project. This isn’t the 606, which went through some sleepy off-the-development-radar neighborhoods, this area has been a hot spot for 20 years. If this doesn’t happen, Logan Square neither gets more affordable nor does it stay the same. When the roundabout gets addressed, it’s not like the pre-existing gentrification conditions change, this immediate area hasn’t been affordable for a very, very long time. You can ease your conscience a bit, as Logan Square was gentrifying long before 2004. People starting getting pushed to Logan Square from Wicker Park, Lincoln Park and Lake View in the early-mid 90s, the first wave of middle class and upwards folks looking for fixer-upper deals were even earlier, I’ve met folks who moved to Logan from Old Town and the surrounding area as far back as the 70s. The “old” Logan Square will never come back as that is impossible, but neighborhoods all go through cyclical change as buildings depreciate and economies boom and bust; Lincoln Park was full of mansions chopped up into virtual SROs not terribly long ago. What is different today is the Internet has accelerated the process of word of mouth, and developers have capitalized on that. People are now attracted to Logan not just from other parts of Chicago, but from all over the country. I’m all for doing away with the inherently corrupt pay to play zoning system/campaign contribution system we have now, but adding new housing density is only going to speed up gentrification and the cost of living. I get the concerns. But, even when gentrification concerns are present, I just can’t get behind the idea of saying we should evaluate implementing things designed to improve safety based on whether they’ll raise rents and price people out. We’re not talking about simple beautification here—we’re talking about a road design that is outdated and has killed people. There’s a lot else we can do to help combat affordability issues, but leaving dangerous status quo road designs in place doesn’t have to be one of them.